Check our special page for more news about Patrick Dempsey and the Dempsey Challenge. LEWISTON — As of Tuesday, more than $1 million had been raised for quality of life services for cancer patients and family during this year’s Dempsey Challenge. The figure broke a record and everybody involved was thrilled about it, but Patrick Dempsey himself imagines a day when it’s not such a battle. Dempsey, who delighted locals by roaming the Twin Cities on Friday afternoon, was on hand later in the day when the Dempsey Challenge got rolling. At a news conference at the center named after his family, Dempsey was reflective about the mission that brings him back home each year. On the topic of riding, Dempsey was in good company Friday night. 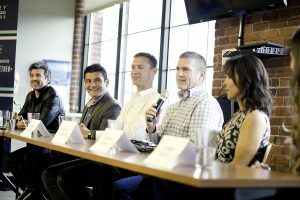 At the Dempsey Center was a team of professional athletes, including NASCAR champion Bobby Labonte and pro cyclists Jens Voigt, Fast Freddie Rodriguez and Amber Pierce. “I’m just honored to be a part of it,” Pierce said. “We want to do everything we can to support the cause,” said Labonte, whose niece survived cancer. Not that it’s all about racing. Dempsey expressed awe at the competitive spirit of locals — including businesses, schools and individuals — who help raise money for the cause year after year. “I’m just so grateful for this community and what they’ve done,” Dempsey said. Brooke Ismail was named this year’s winner of the Amanda Dempsey Award, named in honor of Patrick’s mother who died of cancer at age 79. The award is given annually to a cancer survivor who demonstrates a passion for helping others with cancer in Maine.